When stock market players learn about the peculiarities of the currency market and start trading forex, sooner or later they use candlestick charts. It is this version of the charts that became the foundation for the formation of most indicators and advisers, who in the process of their work produce a price analysis, relying precisely on this model. Most of these programs can display false signals, which inevitably leads players to losses. When the market is in a flat state, for a trader this is one of those situations where indicators can potentially display false signals. Forex exchange, in this position, as if freezes and is on the same level: the price is immovable, it does not rise and does not go down. And most of the indicators are formed on the basis of probabilistic analytics, or a comparison technique. That's why, in this case the system fails and we see an error signal. Professional stock exchange players point out that during this period (the phase of stagnation), indicators, for the most part, provide traders with a signal for sale, and this is nothing more than a road to financial losses. But, in the late 90s of the last century, experts found a solution. It was the new development that made it possible to eliminate the errors and imperfections of the instruments used. The developer of the Range Bar corrected the system of creating candles. If in a classical, traditional model they are created in time (for example, for 5 minutes or the hour: after the price passes a fixed time interval, a new candle is formed), then in the updated solution, the candle is created through a spread of prices. If we set an interval of 15 points, then each bar (candle) will be created until the price passes this interval. In other words, the candles are not influenced by time, but more dependent on the timeframe - the gap that the player chose. And, consequently, Range is a new version of the charts, which is based on the price range, not on time. It is this model that allows us to avoid losses and has become very attractive to forex traders. But how correctly to use Range Bar? 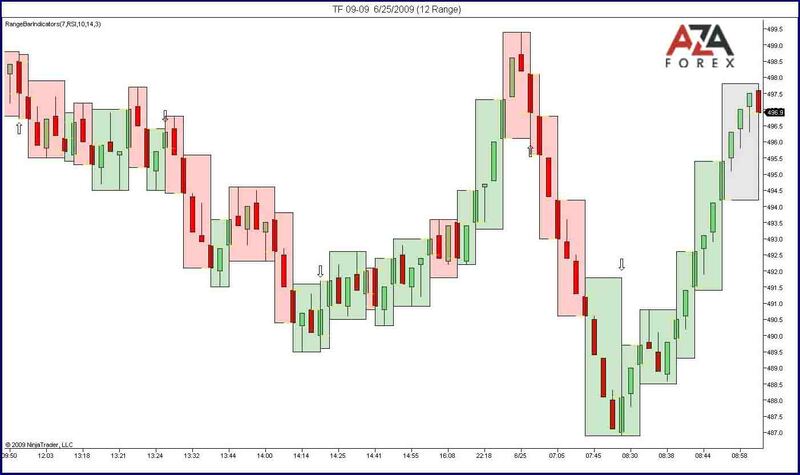 This is a new variant of visualization of price parameters on the chart: this is not a standard tool for trading terminals, and it does not exist in the metatrader. To start using the Range Bar, you must first download a special program, and then install it on your platform. This indicator is available for free download. 4) open the schedule using the Range Bar. After the successful process of setting the indicator, the trader can observe pure trends: no noises or temporal distortions. The price movement of the asset is shown in red and green. If the color of the candle is green, this indicates that the price is rising, and if red, it indicates its fall. On this chart it is possible to use indicators, such as, CCI, its curve is very smooth. A trend of this kind is observed on all chart pairs or other instruments. 2) the time interval setting is only needed if several financial instruments are used. If a trader wants to see only one currency pair on the chart, it can be missed: the main goal of a timeframe is to open a couple of charts for the same instrument. 3) restart the ON ASK PRICE CHANGE window, thereby visualizing the price change due to bid or aska adjustment. With this indicator, we can avoid market noise and losses!